Unbelievable - This is the word to describe how it feels watching your dreams come true right before your eyes. Today we visited the house site and found we had a house with walls & roof completed, right before our very eyes. With tears in my eyes I could not believe that we could walk into our new home and locate each and every room in our house. We were transformed from a slab last weekend to under roof today. We watched as they sealed up the seam in our roof peak. It was so much fun to walk through and identify each room of our home outlined and ready to become a room. Amazing. Phill's parents were able to come out to see the house today. 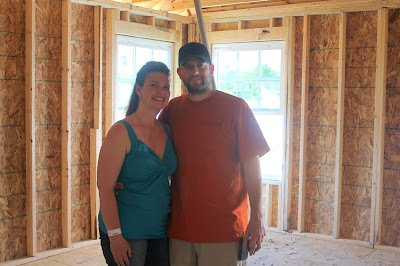 It was so nice to have them along to see the entire house being framed out and ready to go. They enjoyed sitting in the family room and morning room and enjoying our view of the mountains. Look Papa - what do you see? Today was such a blessing to us. We were able to watch our home in the process of being built, realize that our dreams were truly becoming reality and to share the day with family ~ Priceless. Each phase of this process is going to be exciting to be a part of. Such a special time in our family's life.